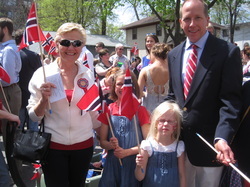 Carol Sersland is the Artistic Director of the Twin Cities Norwegian Dance Group and Co-Artistic Director for the Fjell og Fjord Norwegian Youth Dancers. She also teaches Scandinavian folkdancing at Tapestry Folk Dance Center in Minneapolis and recently taught Norwegian dance to the Guthrie Theater cast of Peer Gynt. Steven Petersen is the Co-Artistic Director for the Fjell og Fjord Norwegian Youth Dancers. He is also involved in Svikt! an energetic Nordic performance dance group based in the Twin Cities. Rehearsals take place on 2 Thursdays every month at 6:30 pm (September through May). Rehearsals are held at Fuller Community Center, 4800 Grand Ave. S., Minneapolis and at 1st Lutheran Church, 1555 40th Av Columbia Hts, 55421. New members are welcome! For more information about joining, please contact Lynndelle Pratt at dellbells@gmail.com. 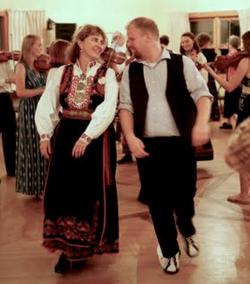 No Norwegian heritage required - just an interest in the dancing. While we don't have a ton of storage space, we are always pleased to accept donations! Bunads for boys and girls are especially appreciated, as are cash gifts which can be used towards purchasing bunad accessories or funding special events. If you would like to donate materials to Fjell og Fjord or volunteer in some form (helping with sewing, marketing, etc. ), please contact Mary Kay Peterson at ​Marykay@redracecar.com.